Sekhmet whose name means: “She who is powerful” or “the One who loves Ma’at” was the goddess of the hot desert sun, plague, chaos, war, and healing. She was created from the fire of the sun god Ra’s eye when he looked upon Earth. Ra created her as a weapon to destroy humans for their disobedience to him and for not living in accordance with the principles of Ma’at. Sometimes she is seen as the daughter of Geb (earth), and Nut (the sky). Sekhmet was depicted with the body of a woman with a lion head wearing a sun disk. She was seen as the protector of the pharaohs and led them in warfare. When she was in a calmer state she would take the form of the household cat goddess Bastet. Sekhmet was a terrifying goddess, however for her friends she could avert plague and cure disease. She was the patron of physicians and healers. The ancient Egyptians believed that Sekhmet had a cure for every problem. In order to stay on her good side, they offered her food and drink, played music for her, and burned incense. They would whisper their prayers into the ears of cat mummies and offer them to Sekhmet. They believed that this was a direct connection to the deities and their prayers would be answered. 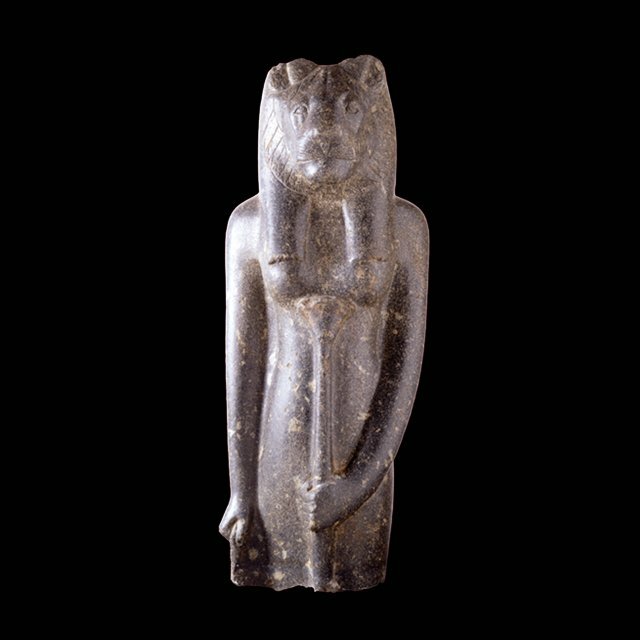 Image: RC 1605 Standing Sekhmet, Rosicrucian Egyptian Museum.